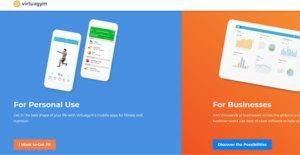 Virtuagym is a cloud-based fitness membership and coaching application, a one-stop fitness software solution for personal trainers, health clubs, and other fitness professionals. Since its launch in 2008, Virtuagym provides thousands of businesses worldwide with powerful solutions for both client coaching and membership management. Sustained development in capabilities has enabled Virtuagym to become an ultimate fitness platform for businesses of all scale and sizes providing exercise and nutrition coaching, client and staff management, scheduling, invoicing, online coaching nutrition coaching, online payments, access control among others. With Virtuagym, fitness professionals can focus on effective fitness coaching, while running a successful business. Virtuagym’s custom branded apps and online community are a perfect way to promote a club’s or a trainer’s brand and boost client engagement. Flexible membership options and hardware and other essential third-party integrations offer ample opportunity for rapid and sustained revenue growth. Along with this, Virtuagym allows the businesses to accept payments in different forms like cash or direct debit cards with automated online payment modes. This adds to the ease with which members can use Virtuagym. Along with these robust features, Virtuagym is backed by outstanding customer service. This and integrated business models offer plenty opportunities to generate revenue with Virtuagym. 1. Comprehensive fitness module attracts more members. Combining focus on physical fitness programs and nutrition software directly appeals to health-conscious individuals who see health in a holistic way, addressing not only the rigors of physical discipline but also of nutrition balance. 2. Fitness in the age of IoT and the cloud. It’s no secret that no business is immune to the advances of doing business via the cloud around the concept of internet of things. By porting its operations to the cloud, Virtuagym ushers fitness business into the most advanced ways of addressing the needs of its health conscious customers and its own operations. Online sign up, payment via PayPal or PaySafe, online coaching removes many known hassles for business owners, fitness trainers and coaches, leaving them more time to focus on things that matter to them. 4. POS software, cloud access and reporting minimizes risks of fitness business. Like most businesses, providing fitness services to paying customers involve some chance of lost revenues and assets. Real-time access to data systems allow owners to sniff anything that is out of place instantly. 5. Rich tool for creative promotional and loyalty programs. Fitness businesses have many avenues to increase their revenues while ensuring they keep their existing customers happy and loyal to their establishment. Virtuagym takes advantage of those windows to advance the interest of the business by making sure customers keep coming back. Most users of Virtuagym point to how the platform has made it easy for coaches and customers to communicate easily and work out the training and nutrition programs that matter to the customers. What Problems Will Virtuagym Solve? As a fitness operator, you know the success of your business depends on how deftly you juggle your roles as a business owner, as a class instructor and as trainer. By taking over those parts of the business that it can handle, Virtuagym allows you to do away with some of the hats that keeps you from the ones that will really determine the outcome of your business operation. Fitness centers are booming everywhere like mushroom, squeezing profit margins like never before. If you want to stay alive in the business, you need a sizable dose of imagination to create meaningful loyalty programs that ensure your clients do not leave you for other fitness centers at the drop of a hat. Virtuagym not only allows you to drum up those promotional programs, it also provides the modern conveniences that not many fitness centers can match. Fitness customers only have so much time to look after their bodies, and a large number of them prefer to have their sessions done in many ways, not just physically presenting themselves at your business site. Online booking and payment, tracking attendance and managing cancellations are heaven-sent capabilities that Virtuagym allows at the click of button. If you are considering Virtuagym it might also be sensible to investigate other subcategories of Best Club Management Software gathered in our database of SaaS software reviews. Enterprises have unique wants and requirements and no software platform can be ideal in such a situation. It is useless to try to find a perfect out-of-the-box software product that fulfills all your business requirements. The wise thing to do would be to modify the application for your specific needs, worker skill levels, budget, and other aspects. For these reasons, do not hasten and invest in well-publicized leading systems. Though these may be widely used, they may not be the ideal fit for your particular needs. Do your groundwork, investigate each short-listed platform in detail, read a few Virtuagym reviews, call the vendor for clarifications, and finally settle for the application that provides what you need. How Much Does Virtuagym Cost? We realize that when you make a decision to buy Club Management Software it’s important not only to see how experts evaluate it in their reviews, but also to find out if the real people and companies that buy it are actually satisfied with the product. That’s why we’ve created our behavior-based Customer Satisfaction Algorithm™ that gathers customer reviews, comments and Virtuagym reviews across a wide range of social media sites. The data is then presented in an easy to digest form showing how many people had positive and negative experience with Virtuagym. With that information at hand you should be equipped to make an informed buying decision that you won’t regret. What are Virtuagym pricing details? What integrations are available for Virtuagym? If you need more information about Virtuagym or you simply have a question let us know what you need and we’ll forward your request directly to the vendor.